This year, Easter is celebrated much earlier (March 23rd) than other years. In fact, the next time this would happen would be in the year 2228 (220 years from now) . Good Friday saw me fasting and praying for the first time in at least three years. Since I am neither pregnant nor breastfeeding this year, it was the perfect time for me to fast, pray and dedicate my thoughts solely to the day Jesus gave His life on the cross for me. Hubbs and I had planned on going to church for the service at noon, but due to unforeseen circumstances, we didn’t…and we are kicking ourselves for that because had we gone, I might have been able to post a picture of the Giddy Tigress with the newly appointed Chief Minister of Penang, Lim Guan Eng. Not that we are stalking him or anything like that, though…but if I do bump into him, I would love to extend a warm hello and welcome as a friendly *neighbour*. On Saturday, we made a day trip to Ipoh to celebrate my nephew Collin’s full moon. It was again another excuse to stuff our tummies with food. Hehe… no regrets there. In fact, we were so full after the lunch that all plans of tar-powing the famous Canning Garden chee cheong fun vanished into thin air (although the stall was only a stone’s throw away). Ah well. There’s always next time. Then came Easter Sunday. As usual, the church was packed full to the brim with parishioners (methinks some of them were hoping that the CM would make another appearance). We had to make do with sitting on plastic chairs placed by the pews, because we were ummm….a few minutes late. Actually, it was rather a blessing in disguise because we had a full view of the altar and was able to concentrate 100% on the sermon being delivered. Well…maybe 90% because of intermittent distractions from Ethan. Although Race Day ended with Kimi getting what he deserved (yay!!! ), I shall choose not to say anything about the Super Sunday score, which I don’t think was super at all. Bleagghhh…. This entry was posted in Christianity, Close to Heart & Home, Drooling & Cooking, Thoughts & Scribblings. Bookmark the permalink. LOL, then there will be another pair of eyes to see if the CM knows the Hail Mary. Another blogger WMD told me she saw his mouth moves during Our Father and not Hail Mary and Glory. We were all so patphor to guess his religion. Hahaha. I was on duty jaga the 240 slides on that day (due to stations of the cross etc) so I really have no time to ‘khap’ too much. But he did kneel, stand x 15 times of the stations of the cross though. The Giddy Tigress says: What are you guys doing counting how many times he stood and knelt? Hehehe….. The Giddy Tigress says: Next time I eat lormaikai I take pictures and send them to you okay?… tick tock tick tock…. wahh..u are a vy good cook. The Giddy Tigress says: Ah…you Man U supporters all love to rub it in! Sheesh! I thought you like Kimi…looks like supporting the constructor is more important to you eh? Glad it was a good Easter for you! 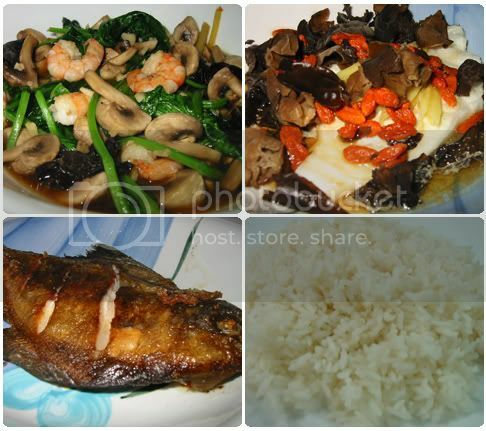 And what’s that fungus, kei chi thing on the top right picture? Looks delish! The Giddy Tigress says: Oh, that dish is steamed cod fish. Made it specially for Ethan. I added the fungus (cleanses blood) and kei chi (good eyesight) because I discovered I still had some of it in the fridge! So easy to make too! Wow.. you’re a really good cook, GT! I’ve yet to figure out how to fry a fish. The Giddy Tigress says: Oh, but of course! And we should never ever forget that 🙂 Blessed Easter to you, Michelle! The Giddy Tigress says: Blessed Easter to you too Rinnah! Well, as long as you keep the message of Easter in your heart, you are celebrating it already! The Giddy Tigress says: Never tried the Old Town one…are you referring to the authentic Ipoh Old Town coffee shop or the Old Town franchise? Well, even though I was there too, I didn’t know that the CM went as well until I read the papers. I didn’t expect it to be that crowded at such hour. And my, what nice dishes. 2 types of fish? So healthy 🙂 Btw, I didn’t know there’re prawns in Jusco. The Giddy Tigress says: Yes, I find the fish in Jusco very fresh, and the prawns are mighty succulent too, I’d add.